Two Northern Ireland companies have been fined and sentenced at Belfast Crown Court after an employee of one of the companies received serious crush injuries as a result of a car falling from a vehicle transporter. An investigation by the Health and Safety Executive for Northern Ireland (HSENI) into the incident, which occurred on 27 November 2015, found both companies had failed to adhere to proper safety procedures when loading a car onto a vehicle transporter using a fork lift truck. Creightons of Finaghy Limited, Upper Lisburn Road, Belfast, was fined £18,000, while Traynors Limited of Armagh Road, Dungannon, was fined £20,000. .
Traynors Ltd, a vehicle dismantling company, was collecting recovered vehicles from Creightons Garage. 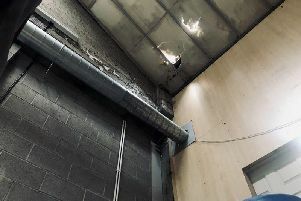 The driver of the transporter, an employee of Traynors, had been attempting to secure a car onto the lower deck of the transporter using a lorry winch when the car, which was being loaded using a fork lift truck, rolled off the forks of the fork lift truck and landed on top of him. HSENI Inspector Kyle Carrick said: “Even though loading salvage cars onto recovery vehicles is common practice, neither party in this incident had adequately assessed the risks arising from this loading operation. Standing at the rear of the recovery lorry was considered to be an unsafe practice as the vehicle had not yet been secured from a safe working position. “It was evident that there had been no cooperation between the two parties in identifying the potential risks even though their employees were required to work closely during the operation. In addition, the injured party had received no formal training from his employer in relation to the safe loading of vehicles. Both companies were fined for breaching a number of health and safety regulations.